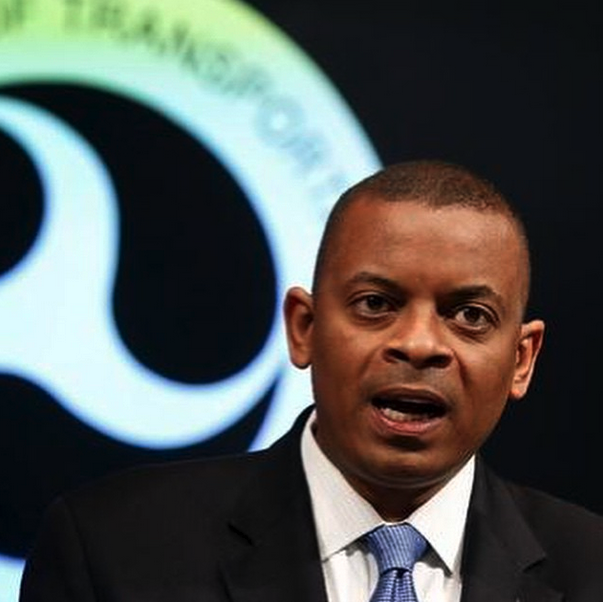 U.S. Secretary of Transportation Anthony Foxx. Austin suffers from plenty of traffic congestion, but the city is hardly alone there. Across the country, cities are having to confront the question of how to move more and more people around in a limited amount of space. On Friday, the U.S. Secretary of Transportation Anthony Foxx came to Austin to discuss transportation issues and what the city can learn from others. His visit brought him to the University of Texas at Austin's Center for Transportation Research, where he got to see research in traffic modeling and connected vehicle technology. The U.S. Department of Transportation recently released 'Beyond Traffic,' a 30-year plan on the future of transportation in the country. "It looks at long-term trends and begins to shape the types of choices we have ahead of us," Foxx says. "And I came here today to see what kind of work is being done on research and innovation in transportation that's consistent with our plan." We spoke for a few minutes on Austin's traffic issues, transportation innovation, and difficulties consistently funding infrastructure and maintenance of the roads we already have. KUT: "What have you seen here at UT that's captured your interest?" Foxx: "There's a lot. Theres an awful lot of innovative uses of data that can help the system move more efficiently. They’re looking at issues around design of transportation assets, the connection between vehicles and other vehicles and vehicles and infrastructure. Those types of innovations will not only make us safer over the next several years, but it will also enable cars to move much more closely together and much more safely." KUT: "I’d imagine that’d be music to the ears of some of our listeners, because we’re kind of in a traffic crisis here. I was curious if there's anything you’ve seen on this tour you think could apply in the near-term to a situation like Austin’s, where we have a lot of congestion at peak travel times. Foxx: "Well, there’s several things. First, transportation is one component. But land use also plays a part. And so if you put additional lanes in place, and you put more development around those new lanes, you’re going to still have congestion. So land use and transportation are always connected, and in terms of the short-term, that’s something to think about here." "You’re also facing just an explosion of population, and that’s not going to abate for many years. And because of that, the other piece that we need to make sure we’re supporting is multi-modal investment across the county, so that individuals who are using the transportation system have choices. Whether it’s getting on the road, using transit, using your bicycle or walking, all those choices are going to matter in the future, because the congestion and the population growth isn't going away." KUT: "One of the other factors we're facing is the funding for transportation is so limited. It's been a few decades since gas taxes have gone up at either the state or federal level. What kind of solutions would you propose for Austin, since we're in a situation where we have to do a lot of the funding for transportation on our own? " Foxx: "I think one of the dangers we have faced right now with local and state initiatives is that the federal government is still so uncertain about its role in funding transportation. Right now, we have a May 31st deadline [on highway funding]. If we go over the cliff, and the highway system isn't supported, that's going to mean that state and local governments are going to find themselves losing money that would’ve otherwise come to them." "So I think one thing that has to happen is, the federal government's role needs to be clarified. We think it should be strong, the investment should be robust, and that’s why we’ve put a bill on the table, and we hope Congress will act on it." "Secondarily, when local governments begin these initiatives, I think it’s really important for the public to take a careful look at them because, again, the challenges are not going away. And this is not a zero-sum game. It’s not a situation where, if you don't invest, you save money — because the reality is, whether it’s time you lose because you’re sitting in traffic, or potholes and you have to get your suspension replaced or tires replaced — the cost is something that Americans all over the country are expending. And my argument is that we’ll be better off if we make the investment, get our roads smoother, make them less congested and that way folks will actually save money at home." KUT: "I wanted to ask you about mass transit. We just had an election here, a light rail proposal that was shot down by a large margin, but we’ve also had additions here recently like our rapid bus system, which we received a lot of federal funding for. Looking at the Department of Transportation's New Starts program, are you seeing more and more interest from city and regional agencies in rapid bus projects in addition to rail?" Foxx: "I think what’s happening is that many fast-growing parts of the country are recognizing that they can more quickly get bus rapid transit on the ground, and many of them putting bus rapid transit on pathways that they eventually would like to convert to rail. So we’re seeing a lot of different models around the country, but the main common denominator is that you’re seeing fast-growing areas realizing that they’re going to have to adapt by creating more choices for the user." KUT: "So here in Austin, if we got federal grants for bus rapid transit — that doesn't preclude us from going back to the federal government in that same corridor and proposing rail there, asking for federal grants there?" Foxx: "No. No. Not at all." KUT: "One last question. Did you get to use the Capital Metro transit system at all while you were here in Austin?" Foxx: "I have not gotten to use it since I've been here in Austin, but I’m looking forward to doing it on another trip sometime."